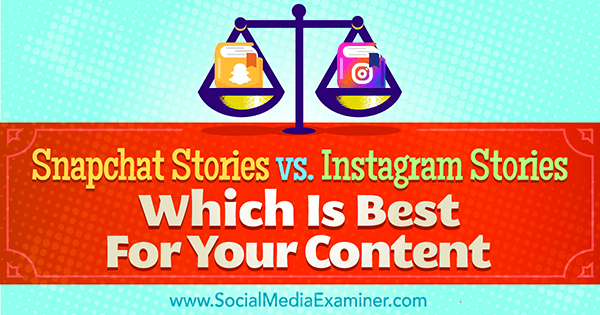 Which is best for you: Snapchat Stories or Instagram Stories? Understanding the unique differences and capabilities of stories on Snapchat and Instagram can help you determine where to invest your marketing time. In this article, you’ll discover the differences between Instagram Stories and Snapchat Stories. Discover the differences between Instagram Stories and Snapchat Stories. Snapchat lets you share your content through a single track called a story, which is made up of 24 hours’ worth of image or video snaps that you’ve shared. Once a snap is 24 hours old, users can no longer view it unless you reshare it. The purely episodic nature of Snapchat works to promote timely engagement and audience retention through consistent sharing of snaps. 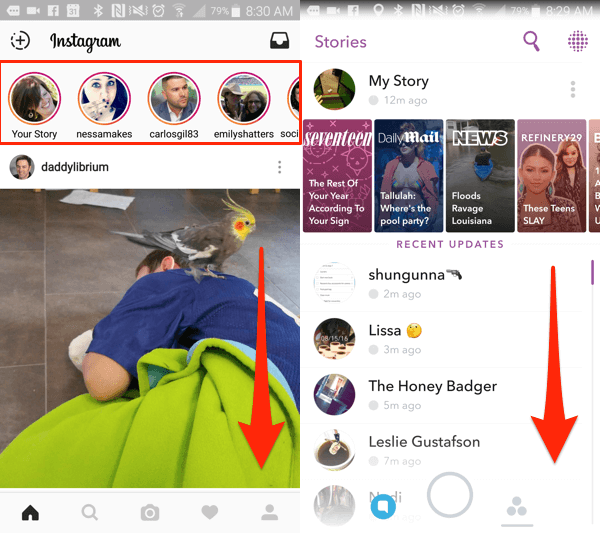 Instagram (left) provides stories along the top and in the main feed, which scrolls below. Snapchat (right) provides stories. Instagram, on the other hand, lets you share content through two tracks: the feed and stories. Your feed is permanent, whereas your stories have a 24-hour shelf life. By combining the longevity of your feed posts with the 24-hour duration of your story segments, you can generate urgency while providing consistent and engaging content for your Instagram followers. Here’s a closer look at how Instagram and Snapchat stories work. To post to your Instagram feed, tap the camera icon to take a new image or video or make a selection from your device’s gallery. You can then select a filter and a cover thumbnail (for videos only), add a caption, tag users and a location, and post the gram to your feed. The post will remain in your feed unless you delete it. 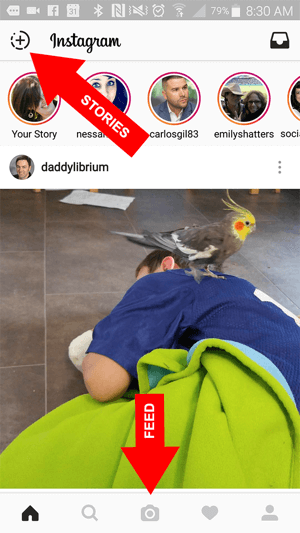 Now with the new Instagram update, you can also share your content as stories. To add to your Instagram story, tap on the plus sign inside the broken circle located at the top left of your Instagram home screen. You can share content on Instagram through 24-hour stories or the more permanent feed. Next, tap or hold down the white button to capture a still image or a 10-second video for your story. You can add a filter, doodles of varying pen types and colors, and lines of text to your story gram. Once you post to your Instagram story, the gram will only be available for 24 hours. Viewers who tap on your Instagram story can fast-forward through your segments by tapping the screen, or replay a segment by tapping the navigation bars along the top of the screen. To add to your Snapchat story, tap or hold down the white button to capture a still image or a 10-second video for your story. You can then add filters, doodles, stickers, and text to your snap. Once you post to your Snapchat story, the snap will only be available for 24 hours. Even if you share snaps from Memories, they’re still available for only 24 hours. There is no permanent feed available on Snapchat. Each snap of your daily story on Snapchat is visible for 24 hours. After that, they’re removed from your story. Viewers who tap on your Snapchat story can fast-forward through your segments by tapping the screen. 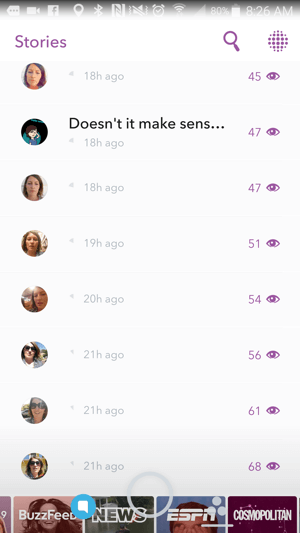 To replay any segments, they’ll need to back out of your story and reenter it to watch each snap once in sequence. Bottom line: Snapchat relies on 24-hour stories from users, providing content that is purely episodic and temporary to viewers. Instagram content can be delivered episodically through stories or more permanently through the feed. The Stories features in both apps provide filters that you can apply to your images and videos. What sets Snapchat apart are the geofilters, face-mapping filters, and motion filters. When you want a customized geofilter to reflect an event or location, Snapchat geofilters will frame your image or video snaps with branding and themes. While large organizations often sponsor geofilters on a bigger scale (think the Olympics or national holidays), Snapchat also lets you create and use your own geofilter. For more casual or personal filters, you can design and submit a community geofilter that highlights a local event or date. For events or locations that feature a brand and prompt awareness or deals, on-demand geofilters can include logos. 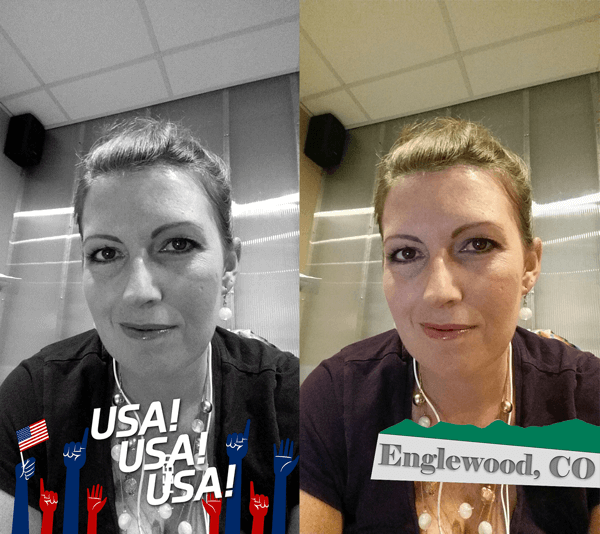 Snapchat’s geofilters are location-based and can be used for a sponsored event (left) or a community need (right). 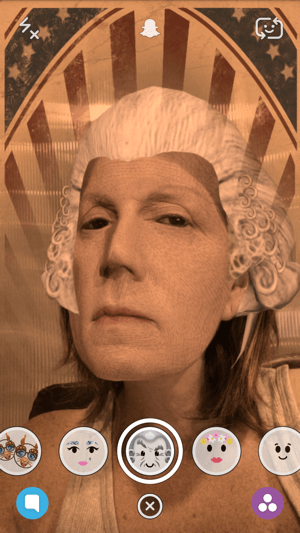 You can apply multiple filters to a single snap. When creating your Snapchat stories, you can use the face-mapping and motion filters to incorporate creativity and linear motion into your sequential snaps. If you press your finger on your image in the capture screen, Snapchat will map your face and allow you to apply one of several filters, which will adjust based on your movement and expression. These include face-swapping filters that let you include a nearby friend or a face from your device’s camera. Face-mapping filters in Snapchat overlay alternate looks onto your face and will match your movements. Motion filters will turn your videos into slow-motion, fast-motion, or reverse-motion snaps, as shown below. For your posts to Instagram’s feed, you’ve always been able to apply filters to change the color, contrast, and lighting of your images or videos. You can apply those same filters to your Instagram story segments. Here’s a brief look at how you can swipe through filters. Although you can adjust the levels and intensity of the Instagram feed filters, you can’t adjust the filters applied to your Instagram story segments. Bottom line: Instagram story filters are limited to overall color, contrast, and lighting adjustments. Snapchat filters provide more options for customization, motion, and branding from the filters themselves. Throughout social media, hashtags function as topical themes, as well as searchable links. How do they work in Instagram and Snapchat and do they work in stories? 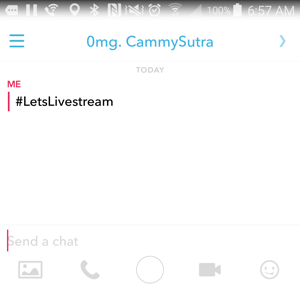 At present, you can use hashtags in your Instagram and Snapchat stories to indicate segment topics or commentary. However, the hashtags don’t provide any functionality for users. In other words, users can’t tap a hashtag to search for that term within the app. While you can share links and images in private snaps on Snapchat, hashtags provide no search function when used in a private snap or your Snapchat story. Instagram’s feed, however, does let users tap a hashtag in a caption or comment to do a search of that phrase within the app. As you consider your use of Instagram stories or Snapchat stories, using hashtag functionality within either app should influence your strategy. Bottom line: You can’t currently use functional hashtags within stories on Instagram or Snapchat; however, you can use hashtags in Instagram’s feed and search functions. Although there are other differences between Instagram stories and Snapchat stories, these three contrasting characteristics will help you determine which platform works best for your content and goals. You may decide to use both in different ways based on how your content can be delivered to your customers. What do you think? How are you using Instagram stories and Snapchat stories? Please share your thoughts in the comments below! 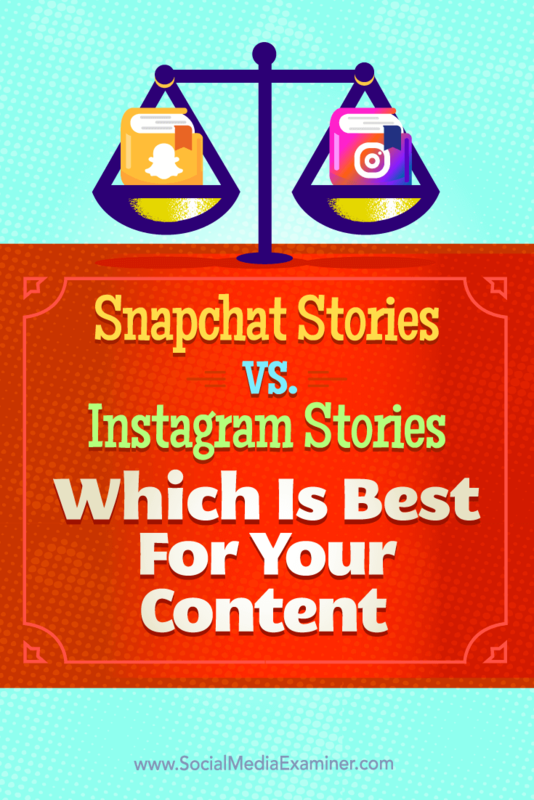 Tips on differences between Snapchat Stories and Instagram Stories, and which is best for your content.